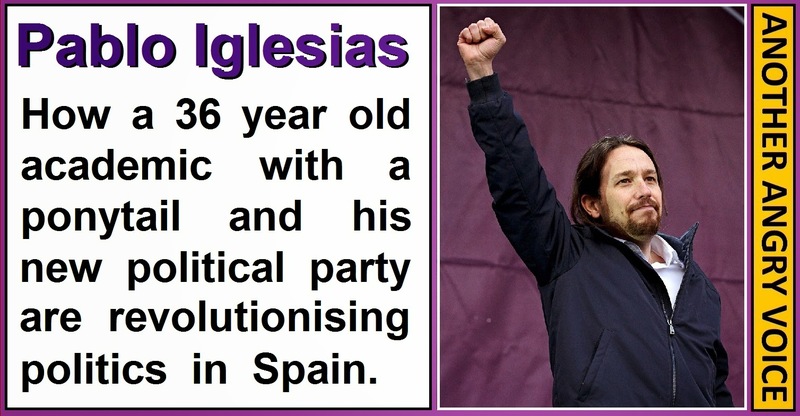 Pablo Iglesias is the 36 year old leader of a new left-wing party in Spain called Podemos (We Can) that was born out of the 15-M street protest movement. Podemos arose out of the 15-M "indignados" protests, which were a little bit like the Spanish version of the Occupy Wall Street Movement, but crucially the Spanish protesters managed keep the movement going and convert it into a powerful political force, whilst the Occupy Wall Street movement has faded away into near irrelevance in the grand scheme of US politics. When the right-wing Spanish government led by Mariano Rajoy brought forward plans to introduce €600,000 fines for people participating in "unauthorised" public protests, they gave the 15-M movement a huge incentive to legitimise themselves as an official political party. Since Podemos was formed in March 2014, the party has experienced an unprecedented rise in popularity. In May 2014, just two months after it was formed, Podemos took 8% of the vote in the European elections to bag 5 MEPs (that's two more than the Green Party managed in the UK, despite the UK having 73 European Parliament seats to Spain's 54). One area in which Podemos is utterly dominating Spanish politics is in the online sphere. The Podemos Facebook page has picked up over 950,000 followers, which is more than the pages of all of the other political parties in Spain combined! In the space of a single year Podemos has gone from a party that did not even exist, to one that is regularly topping the opinion polls. It seems likely that the winner of the 2015 Spanish General Election will either be Podemos or the ruling right-wing PP (a party even more corrupt and right-wing than the Tories!). The rise of Podemos has relegated the traditional left-wing party PSOE to third place in the polls, which is hardly surprising, because just like the Labour Party in the UK and PASOK in Greece, they've completely abandoned their socialist roots in order to push a disgusting concoction of orthodox right-wing economics and pseudo-socialist sweeteners. The rise of parties like Podemos in Spain and SYRIZA in Greece are a direct consequence of established so-called socialist parties forgetting that they're socialists, and pushing a right-wing economic agenda in the hope that their supporters won't notice. Pablo Iglesias is clearly the most important factor in the rise of Podemos. There's something about the man that makes him seem engaging and trustworthy, but it's quite difficult to explain exactly what it is. With his ponytail and scruffy beard he stands out a mile from the Spanish political class, and the down-to-earth engaging language he uses is totally different to the heavily scripted utterances of so many of his political rivals. One of the things that counts in his favour is that he has a lot of media experience. This is valuable for two main reasons. Firstly he knows how the media works, so he can use it to his advantage, and secondly people are familiar with him from the TV show La Tuerka and his numerous media appearances as an insightful political analyst. 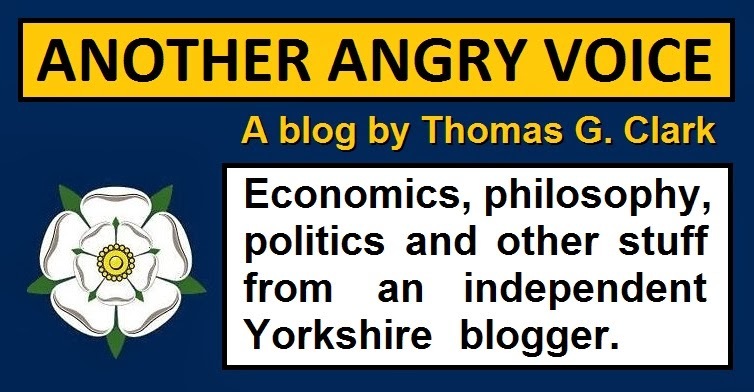 Even though his background is unmistakably that of a left-wing academic, he's somehow managed to position himself as the voice of the ordinary people. One of the ways in which he has managed to achieve this is by talking openly about the historic failures of the left, and explaining that the traditional language and symbolism of the left is worthless, because it does not speak to the ordinary person. Thus the left needs to reinvent itself as a tool to allow people to regain power over their own lives. "Democracy is about taking power from those who hoard it, and sharing it with everyone." "In the context of total ideological defeat, where the left has been insulted and criminalised; and where the right controls all mass media - in order to win, the left needs to stop being a religion and it needs to become a tool for the people. It needs to become the people." "If the right to information is an actual right, you can't let all of the big media groups in this country be controlled by a few multi-millionaires." "The enemy wants us small with a language that nobody understands, wants us as a minority, wants us refuged in our traditional symbols. He is delighted because he knows that in this way, we aren't a danger." "Most people are against capitalism, but they don't know it. Most people support feminism without having studied it. When you see a father doing the dishes or playing with his daughter, or when you see a grandfather teaching his grandson that he should share his toys, in those things there are more social transformations than in all of the red flags that you take to your demonstrations." Another way to illustrate this appeal that Pablo Iglesias has, is to share a copy of the Pablo Iglesias rap which went viral in Spain in early February 2015. The words come from the speech he made to an estimated crowd of 100,000 people who attended the Podemos rally in Madrid on January 31st (the translation and image selections are by me). One of the things you soon realise when you talk to ordinary Spanish people is that they understand that austerity is not working and that it's time for a change. The sentiment I've heard from ordinary Spanish people the most often is that that it's better to go with a new party with next to no experience of running the country, than to stick with the old establishment parties that have a wealth of experience, but only experience of running the country into the ground. 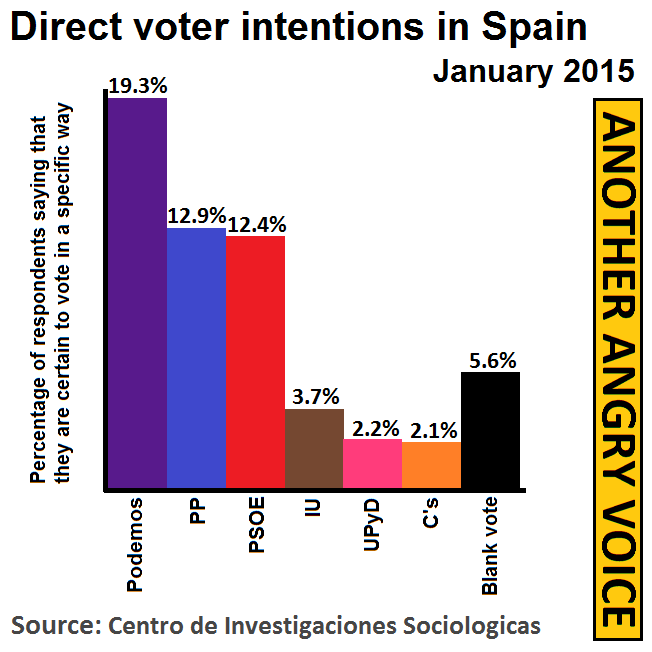 This public recognition that a significant change of direction is needed is reflected in the fact that Podemos lead the direct voting intentions (people who say they will definitely vote for a certain party) by a huge margin, and the number of Spaniards saying they have little or no confidence in the current Prime Minister Mariano Rajoy has rocketed to 85.9%. With youth unemployment still above 50% and general unemployment still above 20% after over three years of austerity imposed by Rajoy's corruption riddled government, the opportunity is there for Pablo Iglesias to lead a peaceful bloodless revolution. He claims that he wants to win an outright majority for Podemos in the forthcoming General Election (which would be within two years of the party being founded), but even if he falls just short of a majority, there would be several smaller parties including the United Left Party, the Citizens' Party and several regional parties that would be vying to help Podemos make up the numbers, rather than face the damaging ordeal of being the "human shield party" to prop up another four years of Mariano Rajoy's sickening brand of austerity and corruption. Why you should question everything, even me! Why do so many people trust Osborne with the UK economy? If the Green Party have the best policies, how come hardly anyone votes for them? What is ... the Pay as You Feel principle? What is the UKIP stance on tax-dodging?